We want to see you focus on your operational management, while we take care of your transport in every detail. Why do we want to stress this? 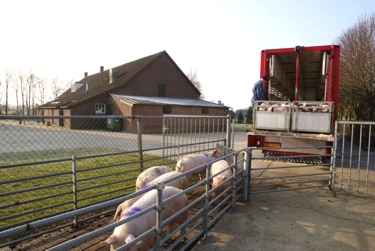 The transport of livestock is subject to strict regulation. This makes it mandatory for the carrier to act meticulously in order to actually follow these rules. Thanks to our years of experience every transport of Van Esseveldt & Loomans Transport B.V.complies with the strictes of quality requirements. That is a reassuring thought, isn’t it? In the course of time Van Esseveldt & Loomans Transport B.V.has built up a good reputation. We achieved this by paying lots of attention to, for example, hygiene during transport. The welfare of the animals, espiecially with regard to loading and unloading, is another important issue. Moreover, Van Esseveldt & Loomans Transport B.V.puts great value on the quality of the delivery and always strives to meet the highest of standards. Of couse the well-educated and skilled staff is the foundation of our success!